Fustini’s Corporate Chef Andy Stewart shares one of his favorite holiday recipes. 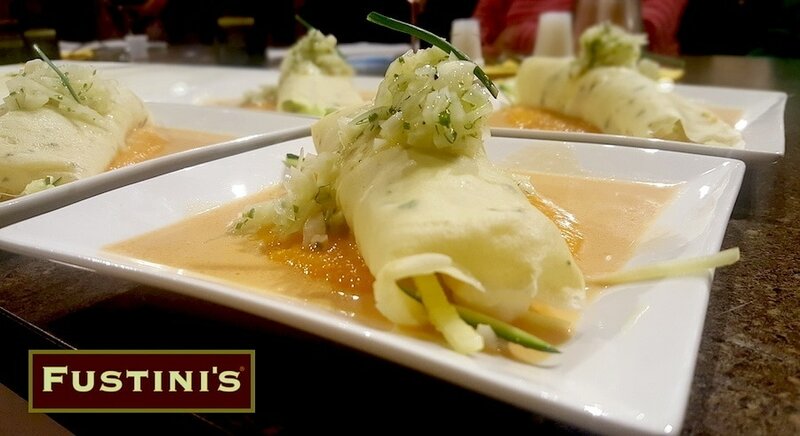 For more recipes, cooking tips and demonstrations, check out these upcoming events at Fustini’s School of Cooking. Cut lobster tails in half lengthwise. Place Fustini’s Single Varietal EVOO and butter in large skillet over moderate heat and when butter is melted add lobster halves and cook turning over several times so the meat does not brown. Flame with brandy, add onion carrot and leek and cook several minutes. Add tomato paste, wine, chicken stock, Fustini’s Sherry Reserva Vinegar, saffron in water and orange juice and bring to a simmer. Once lobster tails are fully cooked, remove from the pan and let cool slightly. Remove meat from tails, cut meat into bite size pieces and set aside. Chop shells and add back to skillet. Continue cooking the liquid until reduced down to almost nothing, then press through fine mesh strainer, and place into small pot. Add heavy cream and season with slat and pepper. Cook until slightly thickened and reserve. Blend all ingredients together and and let rest 30 minutes. Cook over low heat in nonstick or crepe pan. Place squash and lobster meat into each of 6 crepes. Roll to fill. Place acacia honey and orange juice into medium stock pot and bring to a simmer over moderate heat. Reduce heat to low and simmer until reduced by half. Add the rest of the ingredients and cook until squash is tender. Puree and keep warm. Place fennel, fronds and chives in bowl. Combine Fustini’s Sicilian Lemon Balsamic Vinegar, lemon juice and EVOO in separate container and shake to emulsify. Season with salt and pepper and pour over fennel. Stir to combine and let sit 30 minutes. Spoon some sauce onto the bottom of each service plate. Place a dollop of squash in the middle and place a crepe on top. Garnish with a little fennel salad and serve.